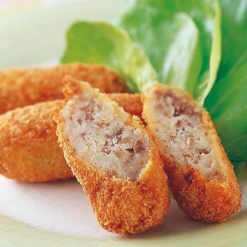 Sugarlady croquettes are prepared in the gourmet restaurant- style, with Sugarlady beef as a main ingredient. It tastes fresh and creamy, prepared with home made-style breading- with eggs and bread crumbs. Packages contain 420g (6 pieces x 70g) per package. Products contain 21% beef, with authentic, restaurant-style light breading. Japanese croquette, or korokke, is a deep fried dish originally related to a French dish. 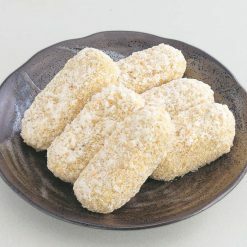 Japanese croquettes combine ground beef with mashed potatoes and vegetables, such as onions. These croquettes are made with Sugarlady beef, obtained from livestock that were raised at contract farms on carefully selected feed, free of therapeutic chemicals, antibiotics or hormones. This is beef obtained from Kuroge cattle raised in Australia, where the water, land, and air are pure. It is our original beef featuring the highest safety and the finest flavor, which was realized by our strict testing and monitoring programs. These croquettes are delicious deep fried. Heat plenty of oil in a pan (until about 170 ℃). Place a frozen croquette in the pan and fry (for about 6 minutes). Be sure to cook thoroughly, turning over once or twice. Cooking times listed in the instructions are approximate. As for the amount of oil, please exercise caution, depending on the quantity that is being cooked.When cooking, please pay attention not to get burned, because the equipment and the product will get very hot. This product contains vegetables (potatoes (domestic), onion (domestic)), breading (bread crumbs, flour, egg powder), beef (Australian), cream, dried mashed potatoes, sugar, soy sauce, salt, yeast extract, pepper. This product is not suitable for anyone with allergies to egg, milk, wheat, beef or soy. Origin of ingredients: potatoes, onions (domestic), beef (Australia). Prepared and packaged in Japan.